Appetizer, lunch or dinner? The choice is entirely up to you, just let us say that it tastes amazing either way. The celery, the dried cranberries, the capers and the toasted pecans – they flow in perfect harmony and your taste buds will recognize this the moment a bite comes in contact with your being. 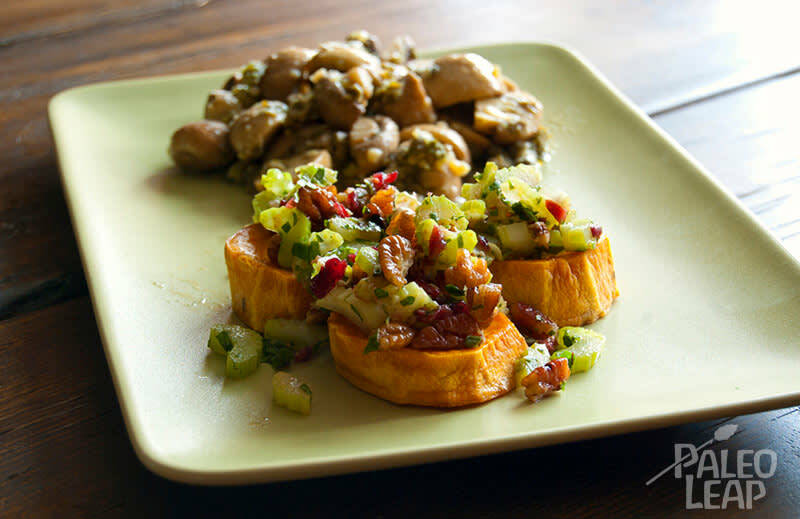 Once it comes into your life, you may even dream about it again, and again, for sweet potato bites with roasted mushrooms is a dish to be repeated as often as necessary. It is a bit like sweet potato bites with guacamole and bacon – pure deliciousness! It may seem complex, weighing in at 16 separate ingredients, but stick with us here, many wonderful dishes are created from multiple ingredients. And it isn’t so much about teaspoons and tablespoons, or measurements in general. A great cook is more concerned about proportions. So when you start adding the pecan mixture to the roasted sweet potatoes, give the final presentation a mindful thought and pretend for a moment that you are famous chef in a world-class restaurant. Cook and bake with the best of intentions and everything (most things!) will turn into a masterpiece. Style your food, no matter how uncomplicated the dish, even your pear and bell pepper ground beef stir-fry will look as appetizing as it tastes. Same goes true for chicken and tomato curry too. Cut potatoes into 3/4 inch discs and coat with the avocado oil. Sprinkle with salt and pepper and allow them to roast for 20-25 minutes. They should be tender and begin to bubble slightly. While potatoes are roasting, toast pecans in a small, dry skillet. In a small bowl, combine the toasted pecans, onions, celery, parsley and cranberries. In a separate small bowl, mix olive oil with vinegar and mustard. Pour half of the dressing over pecan mixture and set the rest aside. Once potatoes are done, top each disc with a spoonful of the pecan mixture. Drizzle with remaining dressing. For roasted mushrooms: Preheat oven to 450 F and make sure the rack is in the middle of the oven. In a large baking dish, coat mushrooms in capers, garlic, avocado oil, salt and pepper. Place several dollops of ghee, or chunks of butter, scattered atop mushrooms. Allow the dish to bake for 15 to 20 minutes, until juices form on the bottom of the dish. Remove from oven and drizzle with lemon juice. Sprinkle with fresh parsley and serve.